The most advanced glass cleaning system ever invented! Imagine getting the inside of your car's windshield spotless in less than two minutes - and all while comfortably seated in the driver's seat! Glass Master's patented swiveling paddle system with 14 inch handle easily reaches into every corner, nook and cranny, no matter what the shape of your windshield. Includes 2 triangular sponge faced paddles, 3 reversible cleaning bonnets (one each: micro-fiber, nylon mesh and cotton terry) and instructions. Also works well on metal, plastic and wood. 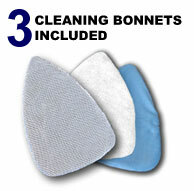 Replacement packs of 3 bonnets available separately.